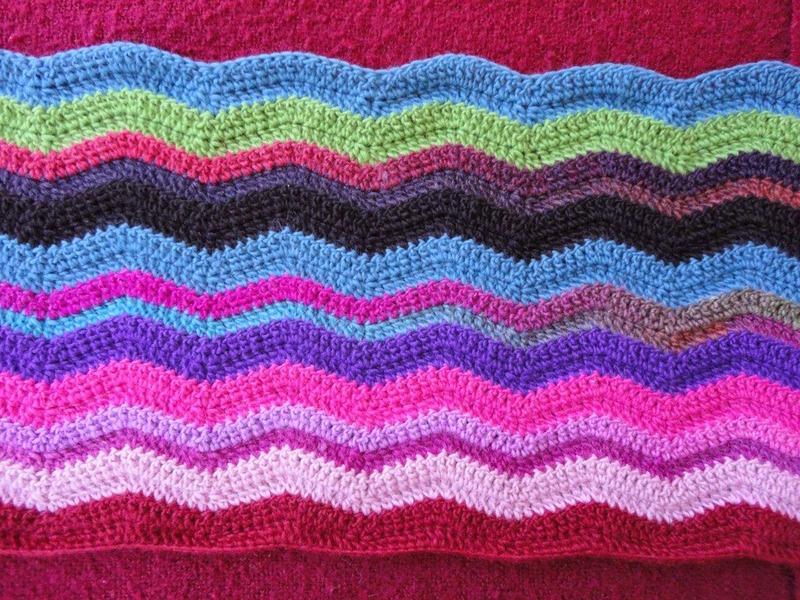 I've been sick for the last week so I decided to make a start on my crochet ripple blanket. I bought the wool with the intention of joining the Down Under Australia Crotchet Along which is due to start on 1 March, but I made a sneaky start last week while I was under the weather (sick). I've crotcheted a lot in my past, so I thought this blanket would be easy enough. My first mistake came when I misread the pattern and cast on 231 stitches instead of 213. I think I only figured that out yesterday after a week of crochet! I suddenly started to think yesterday that I might not have enough wool to make the blanket tall enough. I'm not using the wool in the pattern because they used acrylic. In New Zealand we need wool in the winter, so I'm using a lovely 100% wool called California by AusSpinners. It's lovely wool, but it's not cheap and I didn't really want to spend any more money on this blanket. I laid the blanket on my bed to see how wide it was in reality, and got a shock to see that it was 150cms and covered the top of our Queen sized bed. It was only meant to be 120cms and cover the top of a single bed. I also started to notice how dense the stitches were, and therefore how heavy it would be when it was finished. All of those factors led me to make the decision to unpick 6 nights work and start again with a fewer number of stitches, and a bigger hook. Although the wool says it is 8 ply (double knitting), it feels more like 10 ply so I stepped up from a 4mm hook to a 5mm hook. This time I actually made a test square to see how it would look on a 5mm hook and I liked the more open texture. 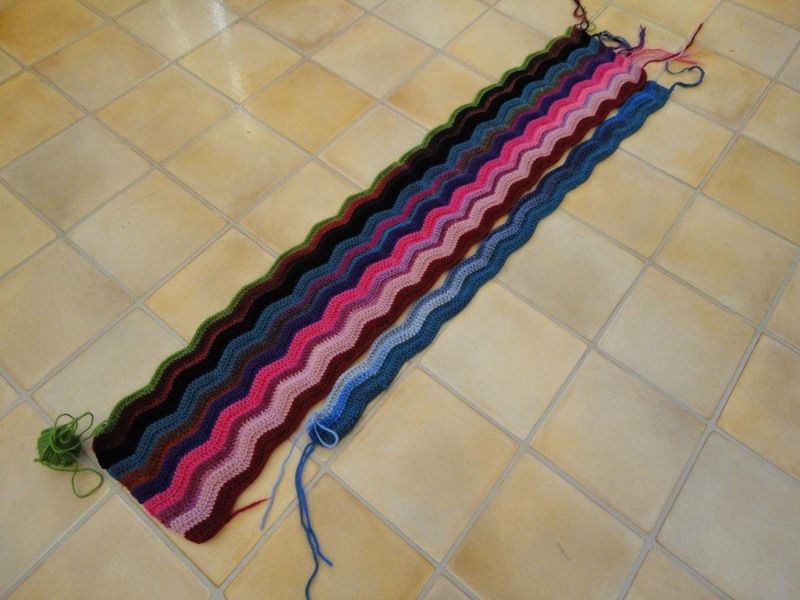 Last night I made a start on v2.0 of the ripple blanket. (pattern by Attic24). I started in blue this time so I wouldn't get confused between v1.0 and v2.0. I'm working to a colour card, but I just started at the top of the right hand column this time. I've now got less stitches in the same number of cms, and shorter rows, so it shouldn't take too long to catch back up to where I was. I still need to unpick the first attempt because I'm going to reuse that wool. Unfortunately the lovely fluffy mohair nature of the wool means that it's difficult to unpick, but I might rope in one of the kids to help wind it up while I unravel it. So the moral of that story is, don't start a new project when you are sick and can't think straight. Even straight forward things can be mucked up if you're not thinking clearly. Hope you are on the mend. I love Attic 24, one of the first blogs I ever followed. 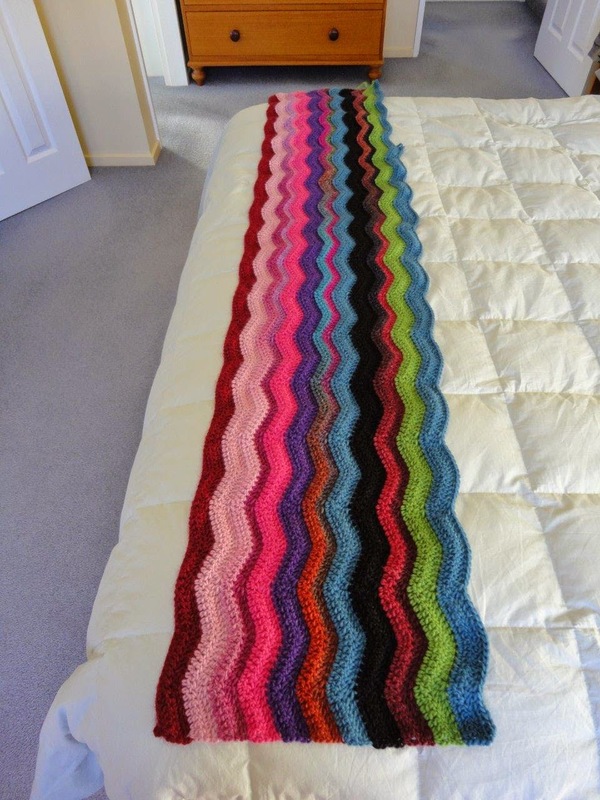 This is looking lovely - great pattern and I love that you are using wool! When doing handmade crochet or knitting I always think so much time spend working on the project might as well use the best you can! hope you get to feeling better - been there and done that! I took up crochet again a couple of years ago, but have let it go again, just don't have time. I use to do a lot when I was a girl. When do you sleep? This is gorgeous. You poor thing, I can imagine the heart sink feeling when you know you have to unpick… but gosh, the most perfect "Wendy" colours. It will be absolutely perfect for your home. Hope you're feeling much better. And the colours so echo the passacaglia heading in your border!! I hope you are feeling better. Hard to unpick a project but with all the work that goes into it hopefully you will be happier with the result. I've been there.. with my knitting. 'Gauge, shmage! ', I'd think. Ha! Oh how I've learned the hard way..
Ooh. I know about unpicking fluffy wool. Like you, I would have chosen a real wool over acrylic every time. 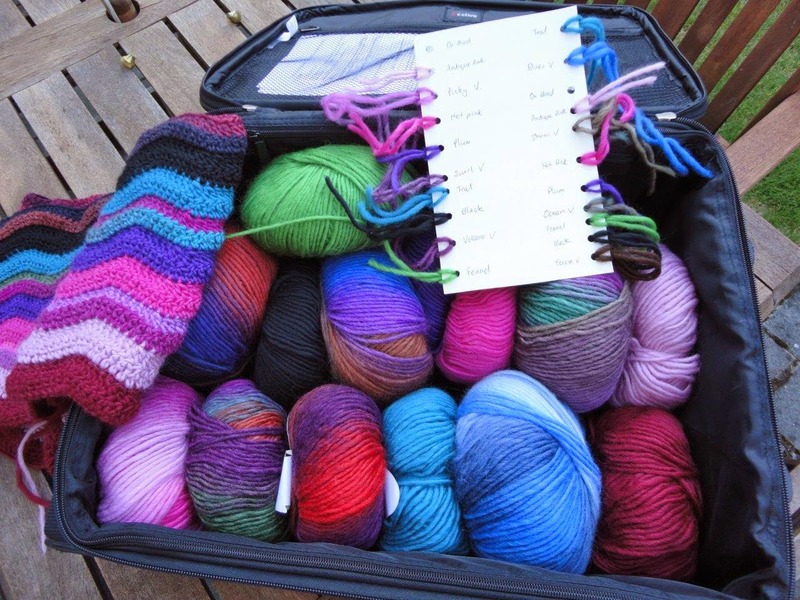 Even with the unpicking, I have a nasty feeling you will beat me and finish this ahead of me and my knitted blanket. Maybe I should join the crochet along to keep myself honest! Oh Wendy it must have broken your heart to unravel all of that work :( I hope you are feeling much better? I still haven't learnt how to crochet (tut, tut). 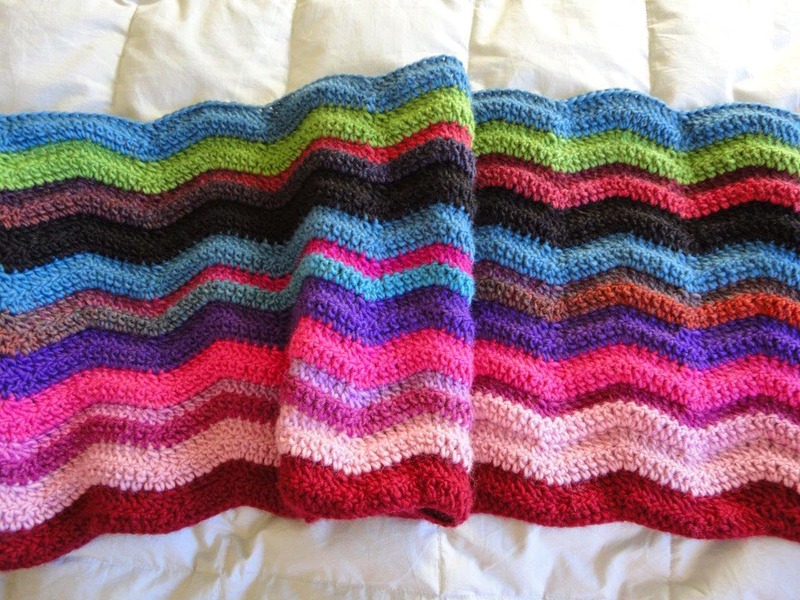 I have a lovely trapezoid shaped crocheted blanket. I keep it to remember the lesson that it's always a good idea to step back and look at your project. :-) Your blanket is beautiful and you are a true artisan to take out 6 days of work because you wanted to go a different path. I hope you're feeling better. It is SO HARD to undo all that work, but you'll be happy you did in the end. I have never mastered gauge when working with yarn, so I've probably actually undone more projects than I've completed. Your wool is lovely. I really like the mix of solids and variegated colors.